Americans for Legal Immigration PAC is releasing the following statement after President Trump emerged from a private meeting with Democrat leaders Nancy Pelosi and Chuck Schumer who are gloating and announcing they have struck a deal with Trump to pass DACA Dream Act Amnesty for illegal immigrants into law in return for some border security measures that will become meaningless against the power and illegal immigration attraction of Amnesty. "It's official that Trump conned GOP voters like me and millions of others into believing he would enforce our existing immigration laws instead of undermining them further with DACA Dream Act Amnesty for illegal aliens," said William Gheen, President of ALIPAC which launched strategies that defeated the Dream Act Amnesty legislation of 2010. 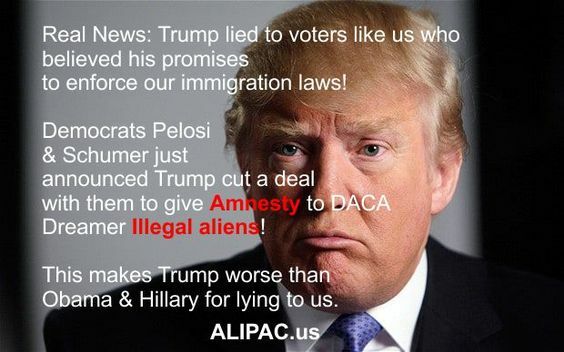 "Trump is worse than Obama and Hillary Clinton because at least those Democrats have been honest about their support for Amnesty. Trump's Amnesty comes at the price of him lying to America about his immigration stances and lying each time he claims to put the interest of America or Americans first! Trump has just become the Mexico first President who is not really a Constitutionalist; he just played one on TV!" ALIPAC will be launching a new round of calls to Congress to oppose Amnesty for illegal immigrants who could set off a chain of events that make Republicans, conservatives, Christians, and non-socialist American permanently obsolete in US elections and governance once millions of illegal aliens gain voting rights once Congress lifts the current penalties of law from illegals. Last edited by ALIPAC; 09-13-2017 at 11:25 PM. The American people have been conned again. President Trump lied about ending DACA day one and when forced by the attorney generals to address it, he left open a door for more illegal alien renewals and he said he granted the 6 month extension till dream act legislation could be crafted and put on his desk for signing. President Trump also gave legalization and citizenship pathways through Advance Parole to illegal aliens since his first day in office. General Kelly has worked tirelessly for illegal foreign citizens and continues his promise to protect them. White House Press Secretary Sarah Huckabee Sanders used the Gang of Eight "comprehensive immigration reform" lingo when referring to the president's plan. Doesn't look good for the nation or for the citizenry. Last edited by GeorgiaPeach; 09-14-2017 at 12:09 AM. ALIPAC, MW and Beezer like this. The White House is now claiming that Trump has always supported immigration reform Amnesty, a point that was missed by the millions of Republicans that voted for Trump's promise of only immigration enforcement in his first few years in office which he specifically stated on the campaign trail. It wasn't missed by me. He was extremely inconsistent on illegal immigrant amnesty during his campaign. I tried to warn people but few would listen. Of course when it came down to a choice beteen Hillary and Trump, I was left with little choice. Perhaps now it is more understandable why I stuck with Ted Cruz during the primaries. President Donald Trump is a disgusing liar! It is quickly coming to the point where I can't stand to look at his face or listen to him speak. I feel the same way hearing him speak now MW. Everytime he says he is going to put America or Americans first a voice in my head screams back "Liar"!